Canada's Under 18 Junior team picked up another Gold Medal this weekend in the World Under 18 Tournament held in Slovakia and the Czech Republic. 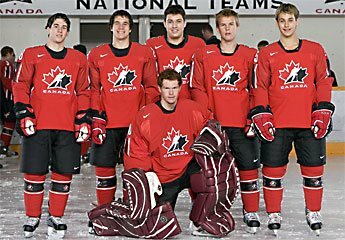 Trevor Cann (pictured in the front row) of the Peterborough Petes picked up the shutout in Canada's 3-0 win over the USA in the championship game. CONGRATULATIONS, Trevor! We're looking forward to a great sophomore season for you with the Petes. With the departure of David Shantz you'll get your opportunity to be the #1 goaltender. Thanks for your regular attendance and support and our twice-monthly MONDAY WE HAVE FISH chapels.